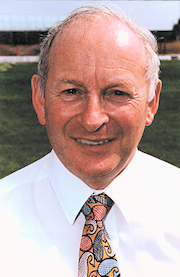 Ken Richardson, was a millionaire businessman, building a family empire around his East Riding Sacks company (founded in 1968) in North Yorkshire. A gambler and horse owner since the 1960's the once alleged he made about �90,000 a year from his betting. In 1982 he was embroiled in a racing scandal with his horse Flockton Grey being switched for a race. Ken was banned from racing for 25 years. Then around 1990 Ken became president of Bridlington Town Football Club and they made steady progress adding a new stand, clubhouse, turnstiles and floodlights. And to that they added success becoming champions of Northern Premier League Division One and winning the FA Vase at Wembley in 1993. Due to legalities, the team were forced to play their home games somewhere else - and somewhat bizarrely Doncaster Rovers' ground; Belle Vue, was agreed. The next season they were relegated but decided to fold instead. Ken took over Doncaster Rovers, frustrating supporters by spinning tales of fellow backers and using faceless companies based in the Isle of Man. He installed his friends and cohorts on the board and payroll, including a former Club Shop Manager at Team Manager at one point. After a reasonable first season things began to unravel, starting with his relationship with the local council, who owned Belle Vue finding out that Ken had advertised the ground for sale in a national newspaper. Richardson, who was later described by detectives as "the type that would trample a two-year-old child to pick up a 2p bit", hired three men to torch Belle Vue and planned to sell the ground to developers for a huge profit. In court he was described by the prosecution as a "devious man" who had offered Newcastle-based private investigator Alan Kristiansen �10,000 to carry out the attack. The following evening Kristiansen, a former SAS man, left a message on Richardson's answering machine, saying: "The job's been done." Kristiansen was arrested after police found his mobile phone at the scene of the fire. Richardson's evidence was described by the prosecution as "the worst concoction of waffle, piffle and flannel" they had ever heard. The bungled attempt left the ground in a state, Richardson in jail, and the club on a collision course with non-league football. Rovers dropped out of the league in 1998 with a -83 goal difference and even had to borrow kits from Sheffield United to keep themselves running.